An Aztech Recognition Agreement is a tri-lateral contract between the buyer of a co-op, the buyer’s bank and the co-op corporation that is required if a buyer wishes to purchase a coop apartment with financing. The Aztech form is an understanding between all parties that the bank will have a first lien on the buyer’s shares and proprietary lease as collateral for the loan. 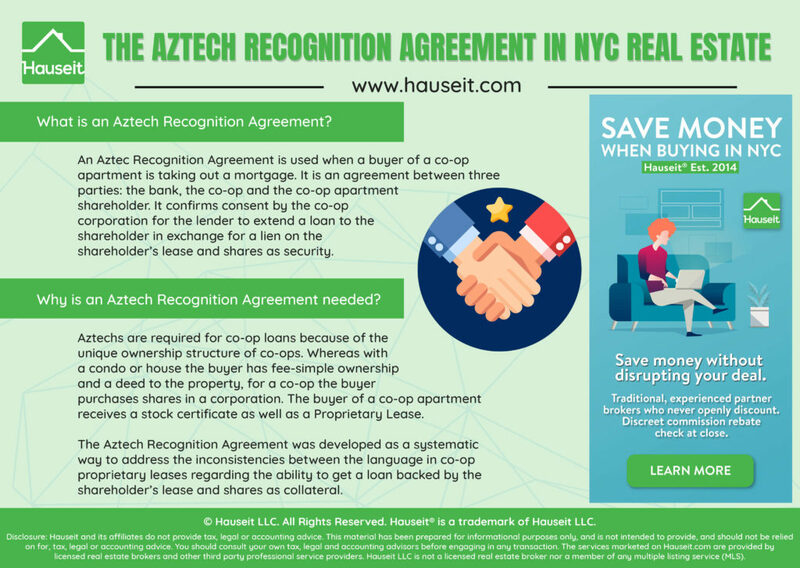 Anyone who has purchased a co-op apartment in New York City has heard of the Aztech Recognition Agreement (a.k.a Aztec form). It’s required by the bank to get a loan and originals are necessary for the co-op purchase application. However, most co-op owners do not know what it’s for or what it does. Why is an Aztech Recognition Agreement needed? It’s important to realize that the language of co-op proprietary leases can vary regarding the ability to get a loan backed by the shareholder’s lease and shares as collateral. Some proprietary leases allow for it, some require the prior consent of the co-op corporation and others are completely silent regarding this matter. Prior to the development and mainstream usage of today’s Aztech Recognition Agreement, lenders would negotiate directly with developers and co-op converters to create custom documents that would allow for financing for individual shareholders. As conversions became more common in the late 20th century, a standardized document was first developed by Aztec Document Systems which mollified banks’ fears about the ability to enforce their collateral while retaining the rights of a co-op to approve shareholders if a bank tried to foreclose on a shareholder. An Aztec form is an agreement between three parties: the bank, the co-op and the shareholder. It is primarily an understanding between the co-op corporation and the bank lender which is signed and acknowledged by the shareholder. It confirms that the shareholder is the owner of the shares and holder of the proprietary lease. It confirms consent by the co-op corporation to the lender extending a loan to the shareholder in exchange for a lien on the shareholder’s lease and shares as security. It prevents the co-op corporation from consenting to any further encumbrances of the collateral without the lender’s approval. This means no further loans, subletting, termination or surrendering of the lease without the lender’s consent. It requires the co-op to accept payment from the bank on behalf of a delinquent shareholder. The co-op recognizes the bank’s lien against the shares and lease, and in the event the lease is terminated and a sale occurs, the bank will be paid the net proceeds of the sale after all sums owed to the co-op are first satisfied. If there is anything left after the co-op and bank’s loan are repaid in full, the remaining amounts will go to the shareholder. Meanwhile, the lender agrees it has no power to transfer the proprietary lease or shares to anyone else without the co-op’s approval. Interestingly enough, the Aztech Recognition Agreement also states that the bank will indemnify the co-op against any liability incurred by any claim the shareholder makes as a result of the co-op’s actions under the Aztec form. The key benefit to a co-op of a Aztech Recognition Agreement is first and foremost the ability for buyers to purchase the co-op’s apartments with financing which will improve property values to the benefit of all shareholders. Furthermore, the notification provisions which permit the bank to monitor the shareholder’s timeliness of maintenance payments coupled with the ability of the bank to directly pay the co-op on behalf of a delinquent shareholder effectively makes the bank a guarantor of a shareholder’s maintenance payments. An additional benefit for co-op boards is their shareholders will generally be much more timely on their maintenance payments. If a shareholder is being difficult or in actual default, all it often takes is sending a copy of a notice to cure to the shareholder’s bank. This works wonders as most shareholders are more afraid of being in default on their loan than of being late on their maintenance payments. It is important to note that a co-op corporation always has a first lien on shares and leases. This means in any shareholder default, a co-op corporation will be paid first on any sums owed to it before a bank. Sometimes banks will try to get co-op corporations to agree to their own version of the agreement. If this happens the co-op’s attorney may agree to minor variations but will likely outright reject anything that eliminates the language protecting the co-op from liability if the co-op accidentally forgets to notify the lender of a default. Buying a co-op? Learn more about co-op rules and regulations which will affect your everyday life as well as NYC real estate taxes and the associated costs of home ownership in New York City.